Found 2 file extension associations related to IGOR - The time machine and 2 file formats developed specifically for use with IGOR - The time machine. Igor - The Time Machine will be the most challenging game you have played in ages. It requires a sharp mind to play and a genius to finish. Are you up to the task? The IGOR - The time machine software seems to be old or discontinued. 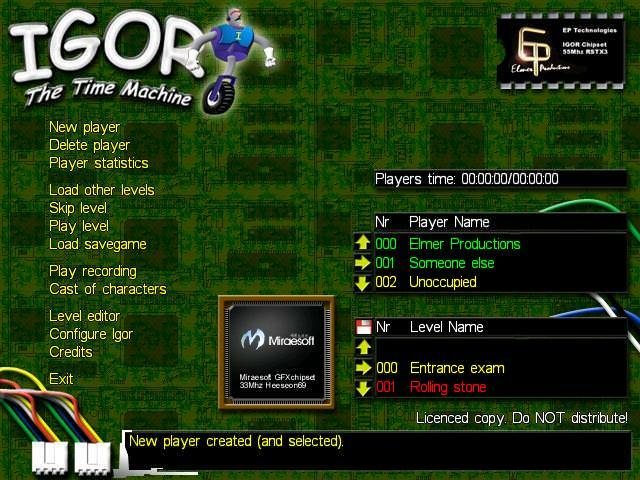 If you need more information please contact the developers of IGOR - The time machine (Elmer Productions), or check out their product website.